Lightened-Up Macaroni and Cheese is so creamy, cheesy, ooey, and gooey that you’d never know it’s better for you! You may not believe me, but lightened-up macaroni and cheese does exist, and I am going to tell you how. But before I do, let me fill you in on my love of mac n cheese. As a child, a box of macaroni and cheese with the yellow cheese powder was one of my favorite dinners. I was a picky eater back then and it was one of the few meals that my mother knew I would eat. And I did so very happily. As my palate and I matured and as I became interested in the study of nutrition and ingredients in food, I came to realize that boxed mac ‘n cheese had nothing on gourmet varieties that are made with freshly grated cheese, added herbs and spices, and lots of butter. So, over the years I have experimented with different versions of macaroni and cheese that would taste just as gourmet but would be a little friendlier to the waist line. A couple of years ago I shared a Recipe ReDux for Baked Mac n Cheese loaded with veggies like cauliflower, mushrooms, and kale. Recently when I experimented with a new recipe, I received so many comments and “likes” on Facebook, Twitter, and Instagram, especially from my friends with young kids asking for the recipe ASAP. So I went back in the kitchen to perfect the recipe and here it is. While it may seem like that’s what’s going on here, the pureed squash added to the cheese sauce is meant to add to the creaminess and gooeyness of the dish and is not meant to be a secret. For parents who have difficulty with picky eaters, give this dish a try, but if your child asks what’s in it, have him taste it and no matter what the response, be honest about the ingredients. I hope your family enjoys this mac and cheese upgrade as much as my family does. I’d love to know if you give it a try and what your kids think – leave me a comment below or tag me on social if you make it! Indulge your family with a dinnertime favorite of mac 'n cheese that's extra gooey and better for your waistline! Bring a small pot of water to a boil; add butternut squash and cook 15-20 minutes until tender. Drain and puree with a hand immersion blender or food processor until smooth. Set aside. While pasta is cooking, melt butter spread in a large saucepan over low heat. Add onion and garlic to melted butter and stir for 1 to 2 minutes. Add flour, mustard, salt, and chili powder; whisk to stir until a thick paste forms. Slowly pour in the milk and whisk vigorously to prevent curdling. Add the pureed squash, stir to combine, and whisk every couple of couple of minutes until mixture is thickened, about 10 minutes total. Remove pot from the heat; add shredded cheddar, parmesan, and chopped sage if using. Stir until cheese is melted and smooth. Mix sauce and pasta. Serve with fried sage leaves if desired. Do you have a dish that brings back childhood memories? If you want it lightened up, let me know in the comments below! That is one gorgeous bowl of pasta! Fabulous idea using butternut squash! YUM! This looks so creamy and delicious. I will definitely be giving this a try this fall! Thanks so much Lauren! It’s a hit with my kids (and me!). Hope you like it too! 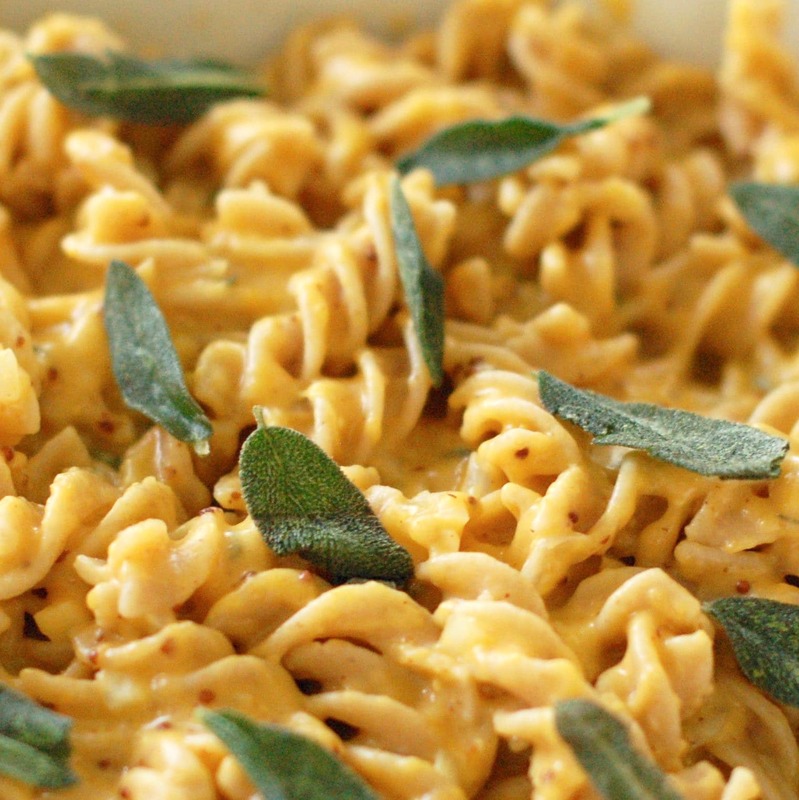 Love the addition of squash to this mac n cheese! Great way to add nutrition and extra creaminess. Thanks so much Sarah! 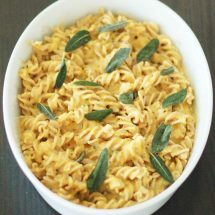 I love getting the extra nutrition boost and it’s still so cheesy without as much cheese as other mac and cheese recipes! This looks dreamy Jess! 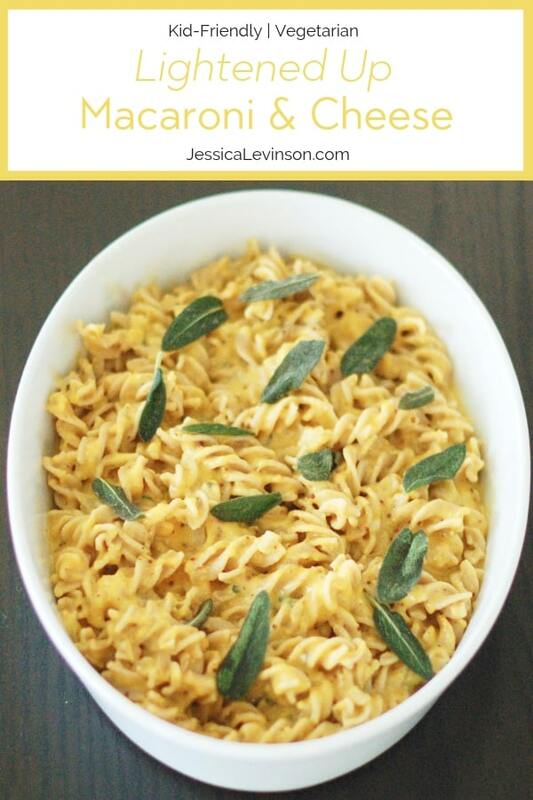 Who didn’t love Mac and cheese as a kid, and I love the grown up version that is so delicious and nutrient packed! Thanks Liz! So glad I’m not alone in my mac and cheese love! I could really go for this for dinner tonight! 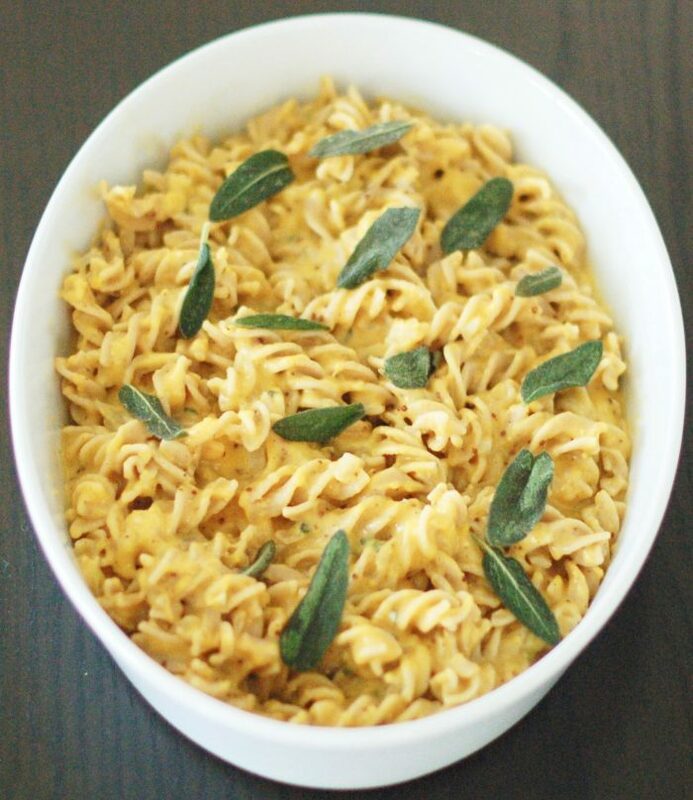 I’ve been craving mac and cheese 😉 This looks so delicious and I love that it’s lightened up! Hope you satisfy the craving soon Christine! I love the way you incorporated the butternut for more creaminess and nutrition! I’ve used this squash for pasta sauce in one recipe and just loved it. Thanks Alisa. Hope you make sauce with butternut squash again! Such a great idea to add sage to this favorite comfort food! Love the lighter alternative! Thanks Kathryn! Hope you give it a try soon. 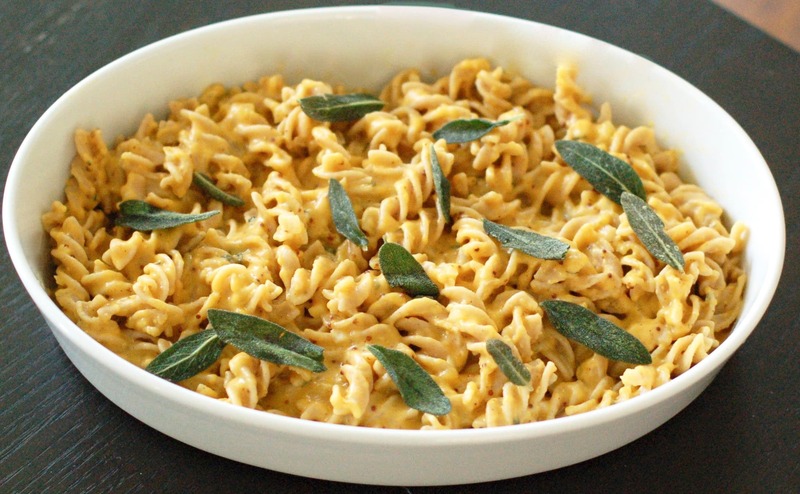 I keep seeing butternut squash Mac and cheese recipes that look so good and this one tops them! Thanks Lorie! You’ll just have to make it soon! I love that this is made with butternut squash, and I think my 3 year old would love it even more! Can’t wait to try this! Thanks Emily! I hope he does love it! How much sodium is in a serving, and how much is a serving? My husband is on a low sodium diet. Do you have a recipe for Chicken Gumbo? Moving to Louisiana when I was 12 , my Mom’s new friends taught her how to make Chicken Gumbo. I use chicken, broth , onions , celery and green onions. For Rue I used to use wondra flour and Canola oil Last time I made it I got sick..wondering if I can use something else in place of the Canola oil? Hi Patrick, I’m sorry I don’t have a recipe for chicken gumbo. I’m not really sure why the canola oil would make you sick – perhaps it was something else in the stew. You could try peanut oil though. Good luck! To bad there is no nutritional values. That would hold some credit of how worth it that it is for a diabetic. Thanks for your feedback. I don’t usually include nutrition info for my recipes because my focus is on enjoying the food you eat without thinking/worrying about numbers. That said, I do understand the need to know for diabetics and I will try to run the analysis as soon as possible.